I’m still very new as a haiku poet, so it is with caution that I’ve ventured out to try an actual haiga. A haiga combines art and a haiku. Since I lack all painterly skills, I’m combining my haiku with a photo that I love. I’ve done this in a slightly similar way on my blog with tanka and some autumn haiku. However, I consider this to be my very first true haiga. Reykjanestá: This location is unique for the fact that there can see the ocean ridge walk on 1 and, Mid-Atlantic Ridge, which separates the prefabricated North America and Europe. 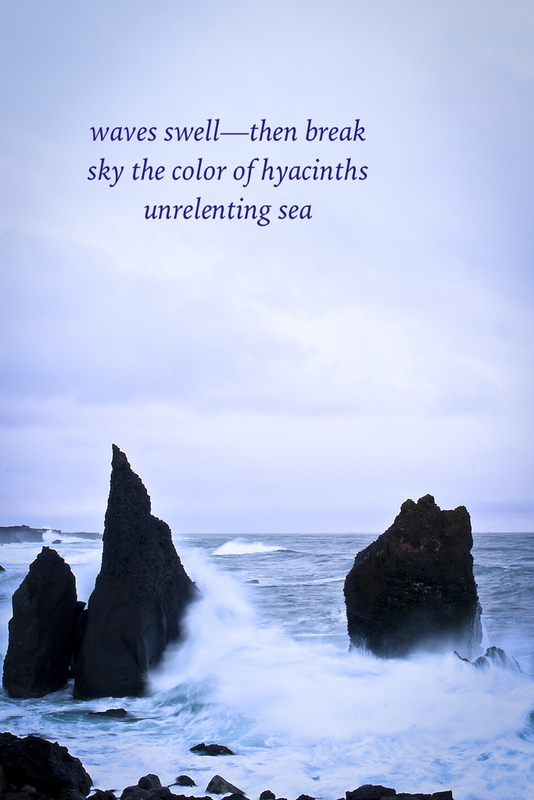 This entry was posted in haiga, haiku, nature poetry, poem, Poems, poetry, poetry of the sea and tagged Ah Ha! Poetry, haiga, haiku, Jane Reichhold, Japanese poetic forms, KariK, KariK photography, Mary Kendall, nature. Bookmark the permalink. Such a lovely haiga and a beautiful photograph. Wonderful work! The color is stunning. Thanks for the notes about haiga, and for sharing your very first attempt. It’s lovely and lively all at the same time. It is beautiful. Well done. Mary I love that you thought of hyacinths. I was able to look at the photo and read your words and feel the color and the sound of the sea. Such descriptive words…you are amazing.